Movies are like little shared multi-million dollar dreams that we get to experience on demand. While they aren't reality, they reflect little slices of the real world like a kaleidoscope or a fun house mirror. What these movies say about the real world is distorted, more fun and a little larger than life. With this in mind there are a whole bunch of famous (maybe infamous) films which take place in part or in whole in our little valley which can give us a little glimpse into how people around the world think about what’s goin on here. Of course everyone knows that Colorado is where the secret world government consisting of the five richest people in the world including The Queen, Colonel Sanders and the Pope meet every year, but did you know that there is much, much more to see here than just our beloved shadow government? Of course the most realistic of all the films ever made about Aspen Colorado is Battlefield Earth. L. Ron Hubbard's saga of the year 3000 is also the greatest science fiction film ever made. Forget Star Wars. Battlefield Earth realistically portrays Aspen in one thousand glorious years, after the earth has been stripped entirely of its shiny gold and turned over to a race of 8 foot tall John Travoltas. Aspen is depicted as it is in the year 3000, a luxury resort ravine full of feral humans on the run from a giant Vinnie Barbarino. As the most historically accurate movie about the future ever made watching Battlefield Earth is quite shocking, but to quote James Joyce "History is a nightmare from which I am trying to awake." For people just getting to the valley this summer there are two films which will give you a little taste of what Aspen is supposed to be and what it really is. Both of these films are set in the early 90's or late 1980's and have virtually identical plots. Two friends take off from their small towns looking for the good life where someone can plug them into the social pipeline. Eeking their way through life these characters are sick and tired of being nobodies, but most of all they are tired of having nobody. These blue collar characters leave their worm farms behind and move to Aspen only to lose everything, becoming bodies crushed in the gears of this luxury resort. And that's just Aspen Extreme. Aspen Extreme is probably the greatest 1980's Ski Movie ever made and the only movie filmed entirely in Aspen, about Aspen for Aspen. I had never heard of this film before coming here, but it is extremely important- a cultural linchpin that holds this valley together. Aspen Extreme is the story of Dexter and some other guy who come to Aspen as ski instructors and live in what looks like a derelict box car in a river. They live their dreams skiing, writing, and dating Finola Hughes the star of the 1983 sequel to Saturday Night Fever, "Staying Alive," (who is sort of on the run from Vinnie Barbarino if you think about it). They get addicted to drugs and one of them dies while skiing in the yearly Powder 8 Competition. This competition seems to be kind of "Rite of Spring" held annually to thin out the ski instructor ranks and ensure that the gods of ski and powder are sated with fresh blood. The lesson of Aspen Extreme is that while half of the people who just up and move here will die because of avalanches or drugs, the other half will certainly fall in love with a soap opera star and become celebrated writers like local heroes Hunter S. Thompson, Walter Issacson, and Emzy Veazy III. Dumb and Dumber is a far more famous film which depicts two working class heroes on an adventure which would make Joseph Campbell blush with joy. Lloyd Christmas and Harry Dunne live hum drum lives in New Jersey, where they have no food, no jobs and their pet's heads are falling off. One day they find a briefcase, owned by a beautiful woman named Samsonite who is on her way to Aspen- where the beer flows like wine. Driven by a sense of duty and love of which troubadours will one day sing- Lloyd and Harry set out on an odyssey to return the briefcase, which happens to be full of cash. Once in Aspen they find out that their quest for love entails spending all of that cash on cars, fancy hotels and saving endangered wildlife in pastel tuxedos. Once they are exposed as blue collar idiots, Lloyd and Harry are expelled from Aspen thrown into the wilderness, presumably walking back to New Jersey. Both Aspen Extreme and Dumb and Dumber have valuable lessons interspersed throughout. We find out that you can't trust John Denver, that the Monkeys were a huge influence on the Beatles and that in life skiing is the easy part. There are some fantastic and unbelievable moments in both. Dumb and Dumber is clearly filmed at the Estes Park Hotel, 200 miles away and is totally devoid of local landmarks. Equally as ridiculous Aspen Extreme has a number of scenes that take place in a regular old greasy spoon diner, nary a Michelin star to be seen. If they were eating at the Gucci Store it would be more accurate. If you just moved here or have lived here for years any of these films are absolutely worth watching. These films offer us a glimpse into our near past and the far future and are a reflection of this place, however distorted. I was born a fool, don't want to stay that way. Forget DiSC or Meyers-Briggs, who are you when you play Dungeons & Dragons? Who am I? Who has the Keys to my beemer? The philosopher Beenie Man first wrestled with these questions on his 1997 dance hall classic "Who Am I" and ever since modern humans have stared into the black spaces between stars, clawing at their skin, mouths agape and drooling while wondering "Who Am I?" Self-awareness is unfortunately a quality which many of us lack. Some of the lesser sages such as Socrates have insisted that the un-examined life is not worth living yet it seems like some of us are full on blundering through existence like a blind person wearing oven mitts. While there are many books written about attempts at self-help and reinventing our lives most people don't make any kind of concerted effort to really develop a sense of self that doesn't include colors or cola preferences. There are a few different ways that people have tried to rate, grade and discover themselves most of these fall short of really uncovering our true selves. This got me thinking, what exactly are people pretending to be? D&D gives people a chance to pretend in a creative story telling setting. Many modern people mostly pretend that they aren't crying at work or that things are going to 'be ok' while the oceans die and bacteria gets stronger, better, faster. Because we are finite almost chimps with a will to power the reality of somatic life brings us into constant conflict with others as we jostle for position and prestige. As a remedy to this situation there are a couple of common tools of "industrial psychology" as well as folksy astronomy which have been utilized to tell people where they fit into this human zoo that we call civilization. Probably the most common every day way to classify people's talents and personalities is an ancient one, Astrology. Simply read the back pages of the newspaper, just to the left of Zits and south of Garfield is your day spelled out by what I assume is a wizened old crone hunched over a gnarled word processor. Science cant explain how Astrology works, maybe because it does not. Does gravity or dark matter play some part in determining your personality? Maybe something about seasonal bacteria and its epi-genetic effects? Yea sure. I remain skeptical, although a quick thumb through our book What your birthday reveals about you: 366 days of astonishingly accurate revelations about your future, your secrets, and your strengths is weirdly surprising and somewhat accurate. My own personal zodiac does line up with my personality, probably because of the position of some exploding balls of hydrogen that some Greek dudes thought looked like a fish. Very plausible, very real, watch out Mercury is in retrograde until May. The personality assessment that most of us have taken in school or in preparation for employment is the Meyers-Briggs Type Indicator, which separates people into sixteen categories with four different metrics for each personality type. The big two are the person's affinity towards Introversion or Extroversion; whether or not you like to speak in public or rather hide under a desk for a while. Once again my own personal experience is that the MBTI explains your preferences for proximity to other people, but try introducing yourself as an INFP (4% of the population AKA the human unicorn along with Bjork, Kurt Cobain and Van Gogh- who would have started a hell of a band) or an ESTP (10% of the population like Teddy Roosevelt or Madonna, who would have dated for sure. The Bull Moose & Material Girl together forever) and see if anyone even knows what that means. Here in the Roaring Fork I was introduced to Dr. William Moulton Marston's DiSC assessment, which is pretty popular if you work for one of the local Aspen institutions, but has a mysterious and strange history. William Marston is best known for the following things, being the creator of "Wonder Woman," being an practitioner of polyamory and inventing the precursor to the polygraph. I would title a book about Marston's life "1920's Shades of Gray". (The actual book about his life is called "The Secret History of Wonder Woman" and the film "Professor Marston and the Wonder Women is now available in our new DVD section). If you've been DiSC'd you should read this book. The most important thing about the DiSC assessment is that you absolutely must score a D for dominant, meaning that you are a boss, like Rick Ross. Anything you do to achieve this result is justified. Lie, cheat, steal, whatever you gotta do must be done because this is your career in the balance. It’s not like you could just get your wife and your girlfriend to do all your work for you like Professor Marston did. And yes, Marston did take credit for much of the work of his partners Olive Byrne and Elizabeth Marston, but that's a totally acceptable D move. The other thing you should know is that there is a single beer limit (of Colorado Kool Aid no less) at the DiSC after party dinner at a billionaire's house near the river. After your banquet beer you will get a healthy lecture about active listening from someone that makes more money in a week than you will in your entire life. I think i could do much with a few billion. Honestly you should give me a couple of millions of dollars so that I can buy centrifuges for the library and enrich enough uranium to develop nuclear weapons. Then we could declare the Basalt Regional Library a Sovereign Nation and get rid of all late fees. And after this the Library will invade and colonize the Woody Creek Tavern. Maybe launch a sneak attack on Crested Butte too. Or pay a bunch of strangers medical bills. Whatever might make the world a better place. Lawful Good v. Chaotic evil or Luke Skywalker v. The Joker. 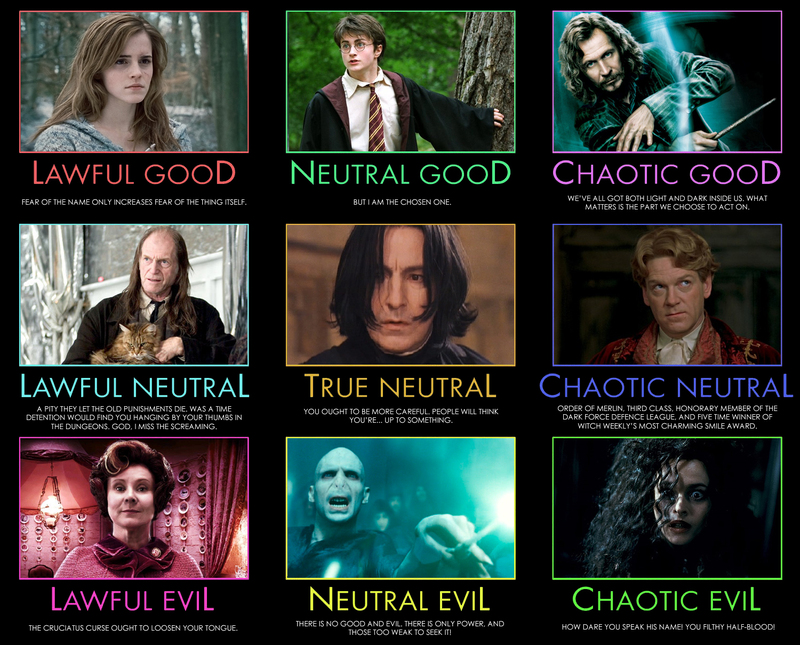 ​This Harry Potter Chart is probably more what you are into, but the character grades remain the same. All characters fit into that scale somewhere. The character you choose to play as for the next two hours says everything about how you would like your own personal human experience to play out. Unlike the MBTI or DiSC systems which ask you to reveal some hidden aspect of yourself, like spraying Windex on the dark glass of your soul, D&D lets you choose what your ideal self could be. When facing the challenges of living, the Trolls of daily life, Mindflayers and Demogorgons of love or finance we ultimately get to choose how to attack these problems. Will you return the gold ring you found in the street, sell it and donate the money to the poor, or hold it for ransom? Would I use the threat of Thermonuclear war to get one of our patrons to return our copy of A Cure For Wellness? ​According to my D&D alignment, probably not. I might wave your fines if you get me a new copy from the Walmarts. That's just the kind of Chaotic Good person I choose to be. Take the D&D alignment test here and post your results in the comments! Cosmic horror: you know, for the kids! Do you enjoy films by Pixar, Disney and Dreamworks? Would you like to turn your children into gibbering madmen, tearing their hair out in search of antediluvian glyphs in the cyclopean ruins of long lost R'lyth? If so may I recommend "Howard Lovecraft and The Frozen Kingdom" a 2016 animated feature film that may have been made by a lunatic. A few of Lovecraft's creepy creatures are here in cute animated form making "Howard Lovecraft and the Frozen Kingdom" maybe an attempt to cash in on Disney's Frozen. This is a winter adventure with a big eyed Cthulhu and his star spawn playing with the young Howard P. Lovecraft himself deep in an animated uncanny valley. If you aren't acquainted with the work of H.P. Lovecraft here is a little bit of background. Lovecraft is probably one of the most influential writers of horror and weird fiction that the 20th century produced. Stephen King, Guillermo Del Toro, Laird Barron, Clive Barker and John Carpenter all owe a debt to this strange man from Providence, Rhode Island. Lovecraft's fiction sits between the Gothic, supernatural horror of Edgar Allen Poe or Robert W. Chambers and later science fiction and horror that many of us would find familiar. This a move from ghosts to gross slimy squid monsters from beyond Pluto. Ghostbusters has a Lovecraftian enemy which can be summoned by a cult through a building, a portal not much different than his Yog-Sothoth which threatens to destroy the world. John Carpenter's Thing is an enemy of cosmic horror that humans can barely understand. Guerllmo Del Toro's Kaiju from Pacific Rim are the exact kind of space freaks that Lovecraft dreamed would hopefully someday consume our planet. Lovecraft's contribution to literature is the idea of Cosmic Horror, that the universe is far too weird, strange, unknowable and horrific for humans to really wrap their heads around. While humans may currently be masters of the earth, not very long ago strange incomprehensible beings roamed places strange and deep and humans are at best a future hors d'oeuvre for Cthulhu, the Blind Azathoth, Nyarlathotep and army of Shoggoths. The names for these creatures may have been created when Lovecraft spilled a set of Scrabble tiles. What defines Lovecraft's creatures are as follows- they have bad attitudes and you could never understand them ever even if you wanted to, much like rapper Cardi B. They are immortal, or unable to die and come from stars long dead and black. Nothing is cuddly, nothing is cute. None of his characters are sympathetic, they mostly are going mad, about to go mad, or are already mad. Another characteristic of Lovecraft's prose is that he often writes in a strange present tense where his narrators are in the middle of putting words down to paper when they are ACK! attacked by a ghoul or gibbering chthonic glop or transmogrify into a fish person in the very middle of a sentence. Howard Lovecraft and the Frozen Kingdom takes a peek into the childhood of Lovecraft, his strange parents and his very close and personal friendship with that which not dead eternal lie, the great Cthulhu himself. None of Lovecraft's major works are tackled, and certainly aren't explained to children in any coherent manner. The animated feature is too sparse, without much music, and looks like a PBS kids feature like Dino Train but creepy and terrible. There are no bright colors or even moments of wonder like in Inside Out or Up, just drab quiet dialogue with Ron Perlman. Howard Lovecraft and the Frozen Kingdom is a strange entry into the world of children's animated feature films, but won’t really give your children a good introduction to the genre of cosmic horror. Why not start with a real Lovecraft classic like Stewart Gordon's Re-animator or From Beyond, films that don’t hesitate to really mess your children up with stretching alien glop monsters and headless zombie professors. How else could you introduce a school age child to the idea that the universe is a swirling maelstrom of chaos, where humans can never truly grasp their own insignificance in the face of ancient alien horror that is out to consume us all? I guess you could let them watch the news. There are many important and essential items which populate the shelves of the library. Some are so necessary to the operation of this institution that we could hardly open without them. Webster’s Dictionary, War and Peace, Tom Sawyer or The Bell Jar are irreplaceable parts of our collection. The 1974 film Zardoz is not one of these essential items. Zardoz was due back a full three weeks ago and almost every time I wander by the Z section of our DVDs I wonder, will it ever return? There are only 6 other films in that section, Zoolander, Zoolander 2, Zombieland, Zulu, Zelarny and Zorba the Greek, its not like I wouldn't notice that someone had absconded with Zardoz. Please bring our copy of Zardoz back. There are a few things about Zardoz which immediately stick out. Its a movie about Sean Connery where he isn't James Bond, someone like James Bond, or an immortal Scottish warrior. Whoever did the set and costume design for this film is either a genius or recovering from a concussion. Academy Award nominated director John Boorman doesn't do himself any favors either. Though he had only the year before directed the Citizen Kane of hillbilly boat rides, Deliverance, Zardoz is a 180 degree departure his previous work. Deliverance left an indelible mark on American culture. Tens of thousands of river rafting trips have been ruined by John Boorman. Zardoz lacks rednecks that want you to squeal for them (like a piggy) but it makes up for that in the first ten minutes by first introducing the film with a floating head, following that floating head up with a larger floating head that vomits firearms, and introducing Sean Connery with a pony tail in a red diaper. The story is something about bored immortals who lust for death and SPOILER ALERT have taught Sean to read the Wizard of Oz to maybe kill them? Your guess is as good as mine and I have seen this film like 3 times. My real point here is that there is NO reason that you shouldnt have already returned Zardoz. Please bring Zardoz back. You watch this movie two times in a week, tops. If you did check Zardoz out I hope it was to study its set and costume design and ultimately turn these elements into a theme restaurant. Zardoz the restaurant would be amazing, wait staff dressed in diaphanous robes and red diapers, mirrors on everything and a huge stone head which vomits out your appetizer. Watch out Casa Bonita. Dream - Essential books and films for Martin Luther King Jr. Day. Is Lego Batman the Best Batman Movie? By far Lego Batman is the best entry in both the DC comics and Lego universes, bringing humor, sly commentary and bright flashy visuals to the character's franchise. Though you might think this is just a movie for kids, it is not. Lego Batman throws in enough Batman and DC comics jokes, subtle Easter eggs and little nods to the 80 years of Batman history that many of us have grown up with to be an incredibly entertaining and funny film. Lego Batman, a self-described ‘heavy metal rapping machine’ who ‘stays out all night wearing black and listening to angry music’ is someone that I personally identify with. This is the best Batman movie probably since Tim Burton’s entries in the series, completely blowing away Batman v. Superman (which would have been better as a terse courtroom drama like Kramer v Kramer) and slam dunking on the neon monstrosity of a nightmare that is the Suicide Squad.